From 2008 to 2010, Submarine Channel and Stedelijk Museum Amsterdam collaborated on the game research project, A Split Second. The goal was to explore “artistic authorship” in video games. From the beginning, the aim of A Split Second was to contribute to the discussion “are video games art?” by creating three playable game demos made by artists and designers. Exhibitions: Stedelijk Museum Amsterdam, Stedelijk Museum Hilversum, La Gaite Lyrique Paris, Tent Rotterdam, Playgrounds Festival Amsterdam. Multi-media artist Han Hoogerbrugge and game designer Sander van der Vegte have developed a unique multiplayer platform game. In FLX., each player controls a character – physically connected to others – by means of an elastic band. 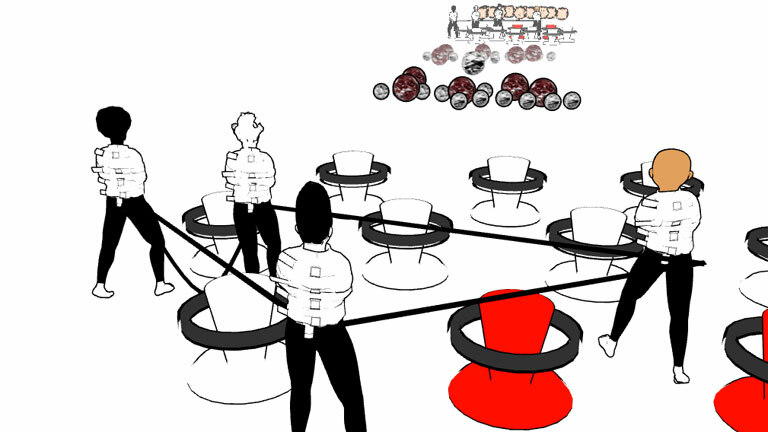 Thus players are forced to collaborate without any possible means of oral or written communication in order to navigate through a series of linked spaces. Like playing poker, the non-verbal behaviour of your fellow-player is the only form of communication. Visual artist Marcel van Eeden and game developer Jorrit de Vries created a short third-person 3D mystery game that challenges preconceived notions of the traditional game avatar. 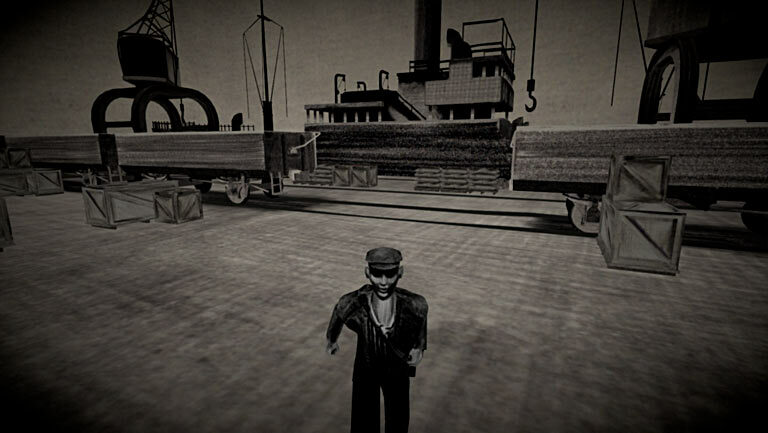 In Sollmann (Part 1: The Harbour), the main character is poisoned at the start of the game and gradually loses his ability to see, hear and move. Set in a 1940’s WWII harbour setting, the game’s narrative, its main characters and the most significant objects, such as the ship the Cornelia Maersk, were adapted from previous projects by van Eeden, thus tying in the game with Van Eeden’s larger body of work. Van Eeden’s analogue pencil drawings have been painstakingly translated to a 3D game environment by De Vries. Visual artist and game designer Jochem van der Spek created Styleclash – The Painting Machine Construction Kit – a competitive abstract drawing game for the iPad2. Each player can construct a virtual drawing machine whose main properties can be manipulated, thus influencing the machine’s visual expressive output. 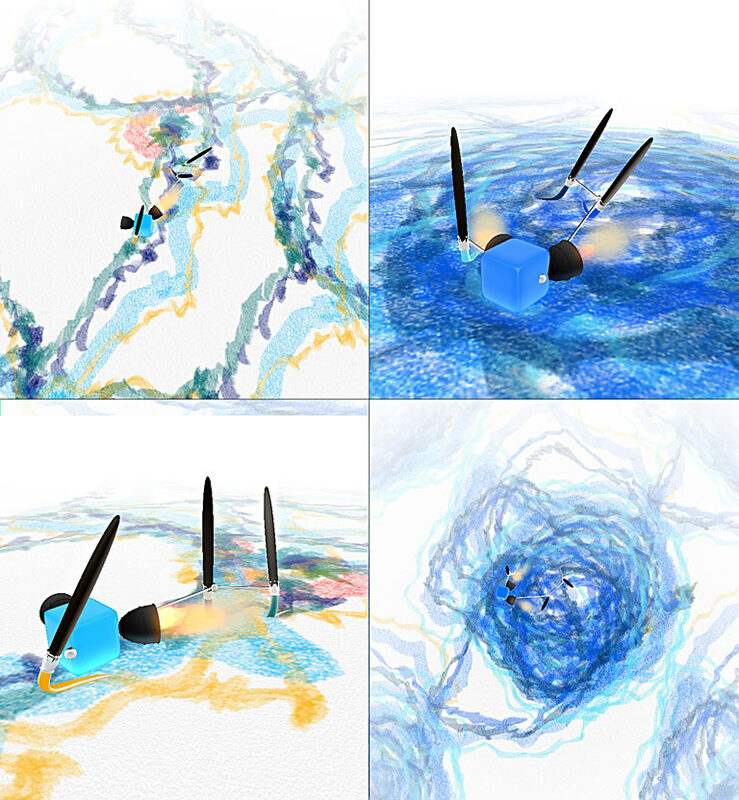 By choosing your type of brush, pencil or crayon and specific drawing technique, your machine creates a unique drawing. Not the players but the machines battle against each other for stylistic dominance in the playing field. Over the course of 2012 these three games were distributed online and/or showcased at other galleries and musuems. Subscribe to our newsletter for bi-weekly updates on Submarine Channel projects. These three short games are the tangible result of a three-year research project with the title A Split Second – an initiative of Stedelijk Museum and Submarine Channel. A Split Second explored the concept of artistic authorship within the context of video games by fostering cross-disciplinary collaborations between visual artists and game designers. The project started in 2008, when the project concept was awarded with the DING! Award, an initiative of the Dutch Cultural Media Fund, Virtual Platform and BKVB Fund. The three games premiered at Stedelijk Museum Amsterdam on October 6, 2011, during the special event ‘Load It!’ The Stedelijk Museum has a long tradition in presenting new developments in art and visual culture. One of the most remarkable phenomena in contemporary culture is the expansive growth of game culture. Whereas the film and art world often overlap, the game industry and contemporary art often seem worlds apart. In 2006 the Stedelijk deliberately started to bridge these cultural domains by organizing the exhibition Next Level and initiated a collaboration with the influential new media lab Submarine Channel. This resulted in the three games that will be presented at Load It! Over the course of a series of meetings, workshops and presentations that took place in 2009, three acclaimed Dutch artists were matched with game designers to create a video game in which they investigate the possibilities of artistic expression in video games as a medium. With these projects, the Stedelijk intends to actively explore the relationship between a modern and contemporary art collection and contemporary media art practices. Is the museum the right context for video games? Games and interactive works are gaining popularity in the arts. In addition, games – as a contemporary art medium – are becoming increasingly visible in the museum’s galleries, for example in the exhibitions: Talk To Me (Museum of Modern Art, 2011), Games – Kunst und Politik der Spiele (Kunsthalle Wien, 2008) and Next Level (Stedelijk Museum, 2006). Games are often perceived as an extension of new media, while their specific properties require an equally specific and unique methodology of both interpretation and contextualisation. In regards to the museum, one may wonder how games can be positioned, exhibited and collected within the art institutions. Is this kind of museum discipline is already practiced and what can be expected of the future: should or could a museum be a place to play games? The projects produced by SubmarineChannel and Stedelijk Museum were made with the support of the Dutch Game Fund (an initiative of the Dutch Cultural Media Fund, BKVB Fund and the Dutch Ministry of Education, Culture and Science), Ding! Award (by the Dutch Cultural Media Fund, Virtual Platform and BKVB Fund), SNS REAAL, VSB Fund and Submarine Channel.